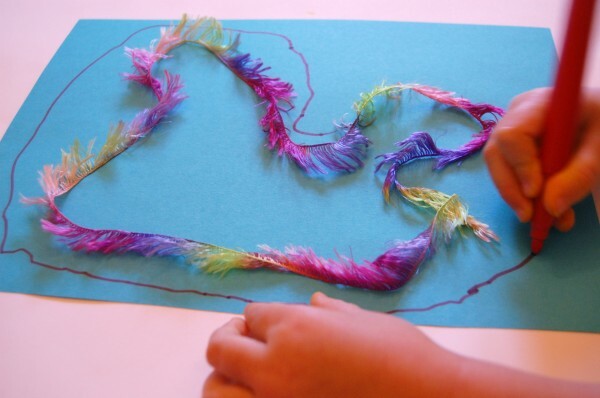 Despite the thousands of ideas you’ve seen floating around the internet, do you ever feel like you’re at a loss for an art activity that your kids will enjoy, while also challenging them to think? 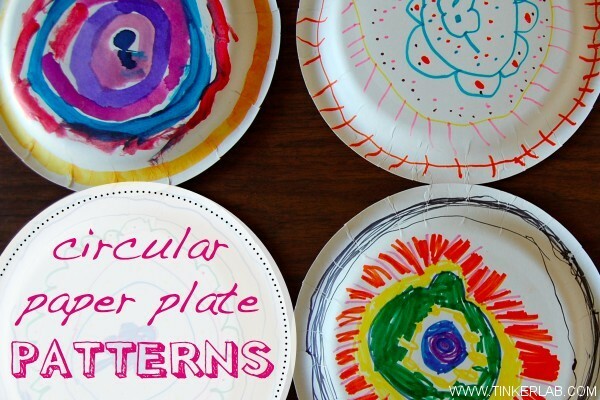 Children get excited about solving real problems, and the problem in this project lies in figuring out how to circumnavigate a paper plate with color and patterns. 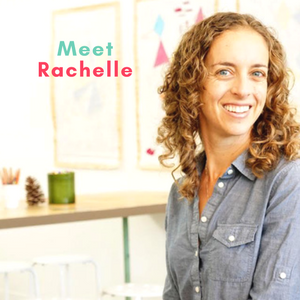 While tackling the challenge of working in the round and developing a series of patterns, you can also feel good knowing that this helps with spatial reasoning and math skills too! 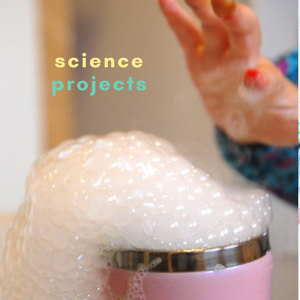 Further, this project is great for building creative thinking skills and the imagination. Oh, and did I mention that the set-up and materials are ridiculously simple. You don’t need a lot of art know-how to make this work for you. 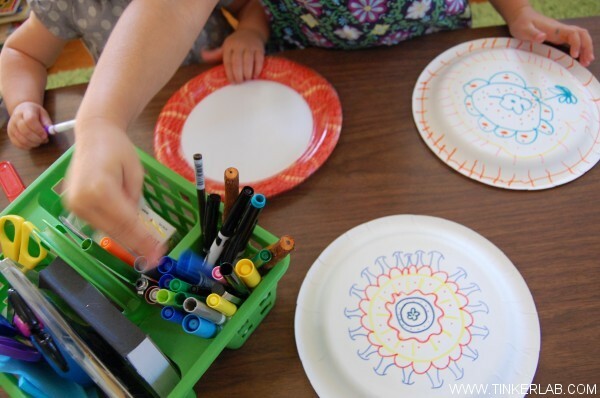 We cleared off the coffee table and I gave each of my children (Nutmeg is 4 and Rainbow is 21 months) a paper plate and a caddy of markers. Simple, right? 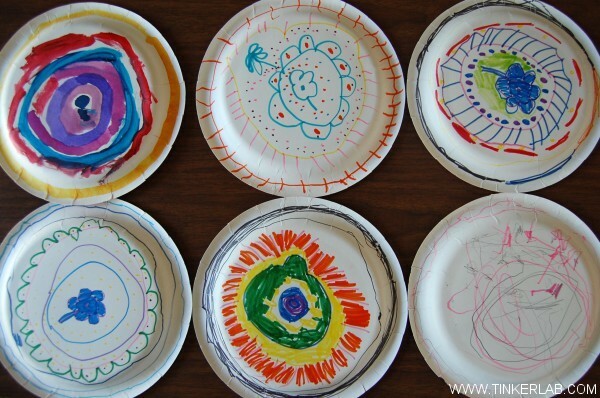 I started by talking about how we were going to draw around the plate in circles, and then began by drawing on my own plate (in the foreground). I started with a small green flower, and then surrounded it with a circle, another circle of dots, a circle, and so on. 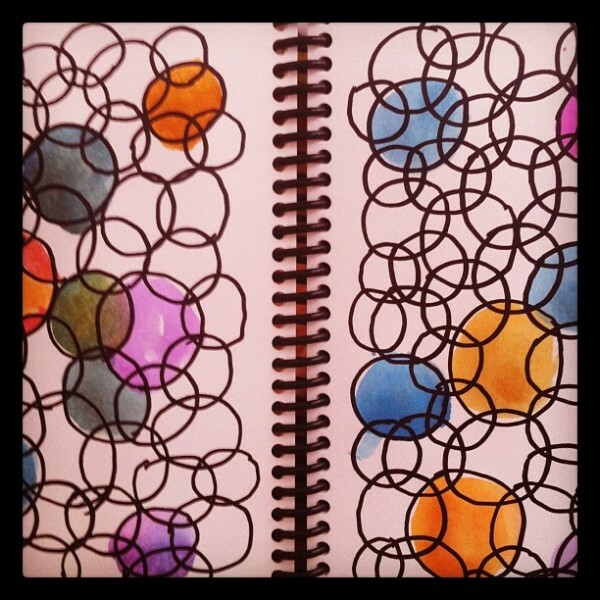 Nutmeg quickly caught on and plotted her own take on a circular pattern. 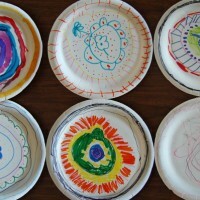 Baby R didn’t draw in circles, but happily did her own thing with plates and markers. Most likely because I initiated my own plate with a flower at its center, many of N’s designs looped around a flower too. The power of suggestion is strong, and I think children can learn a lot from their parents and teachers, but it’s smart to be mindful of this phenomena. 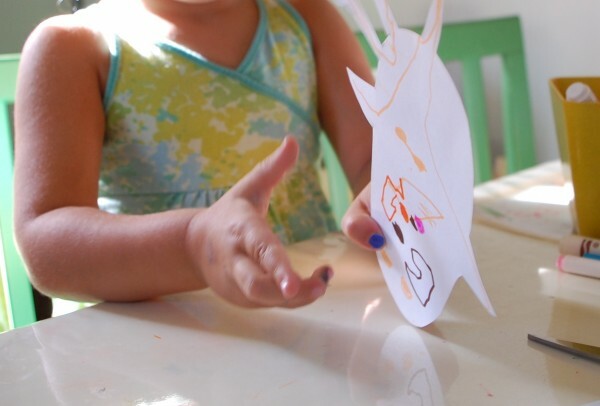 Later in the day while Baby Rainbow napped, Nutmeg wanted to try this project with paint. So I set her up with yogurt containers filled with a little bit of Liquid Watercolor Paint (such a great product, from Discount School Supply). All in all, we created about 12 plates this day. Because they were all colored on the back side, I saved them and we’ll use them on a picnic one day soon. What do you think? 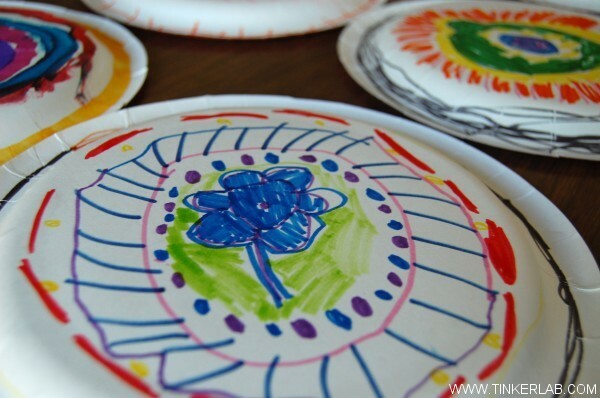 Do you have a stack of paper plates that could use a little bit of color? Or maybe you could try this on your next picnic? 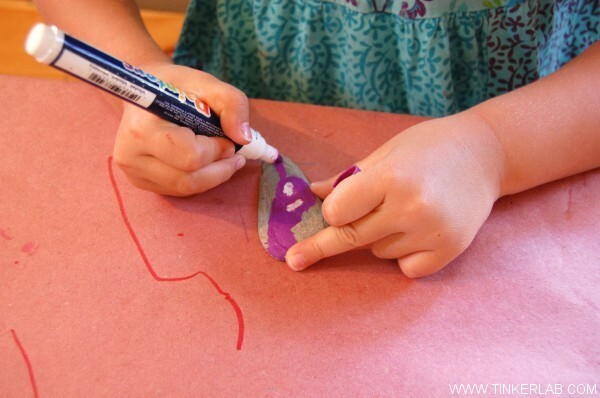 The colors of the paint markers are vivid and opaque (i.e. 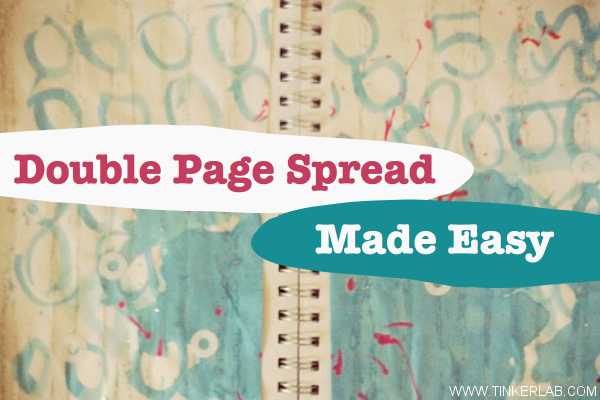 pretty), and very easy to use. 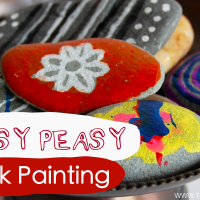 There are lots of ways to paint a rock, for example, we recently painted a big rock with watercolor paints. 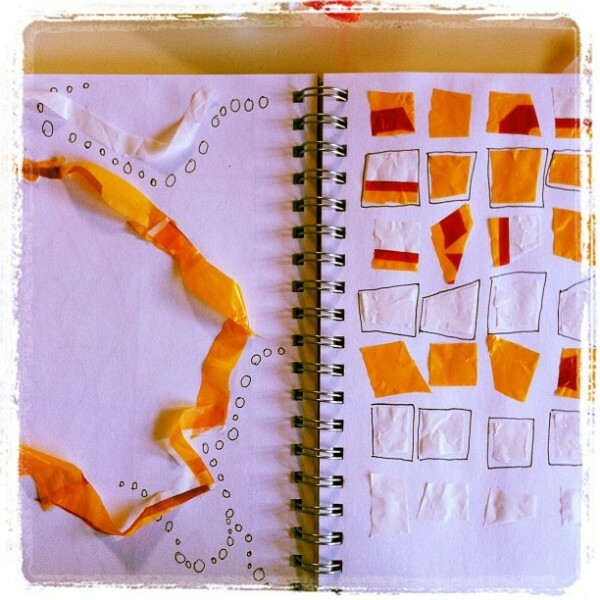 But the method I’m sharing today is so easy and the mess is minimal. 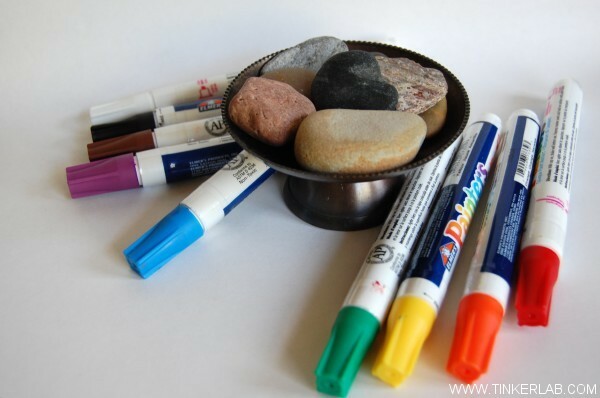 Covered table (the markers leave a mess on the work area that you’ll be happy that you prepared for it). 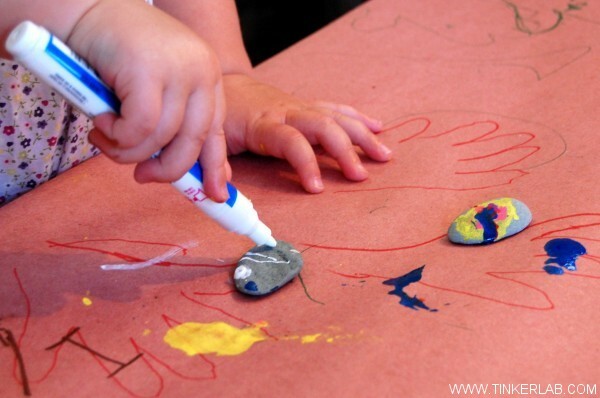 If your markers are new, you’ll want to shake them a bit and depress the tips until the paint starts to flow. Just follow the directions of your paint. 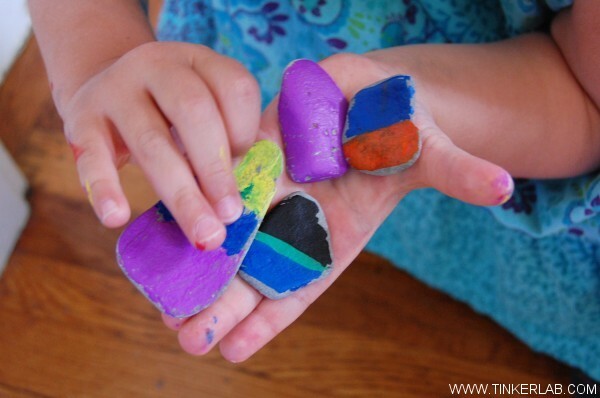 3-year old N wanted to make each of her rocks unique. And her sister, Baby R, enjoyed the challenges of learning to hold the marker and controlling the lines as they hit the rock. N was so proud of her creations, and actually hid her favorites (not seen here) in a closet for Father’s Day. Phew, guess I’m off the gift-giving hook. The rocks really are spectacular and seeing them makes me so happy. 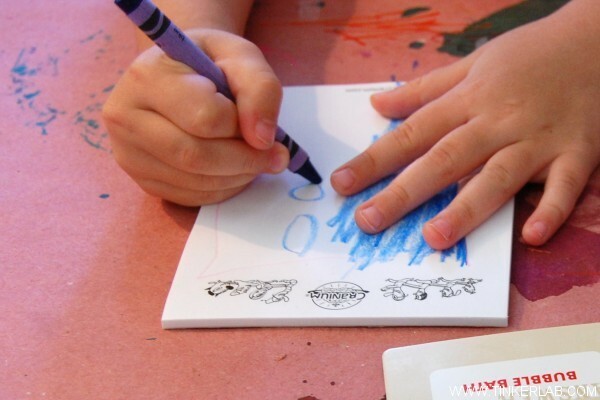 A small clean-up caveat: the ink will get all over your kids’ hands, but don’t fret. 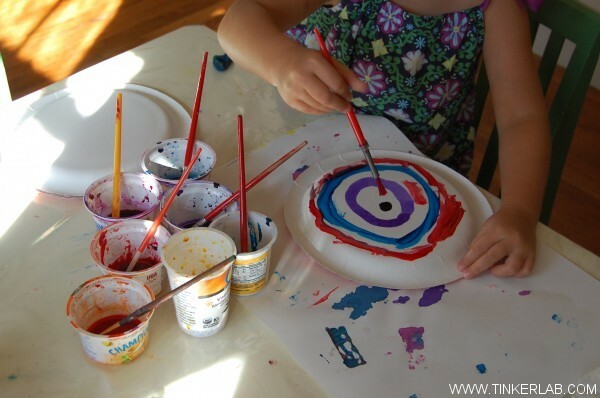 The mess would have been much worse if you’d given them a bowl of acrylic paint and brushes. And it will all come within a day or two. 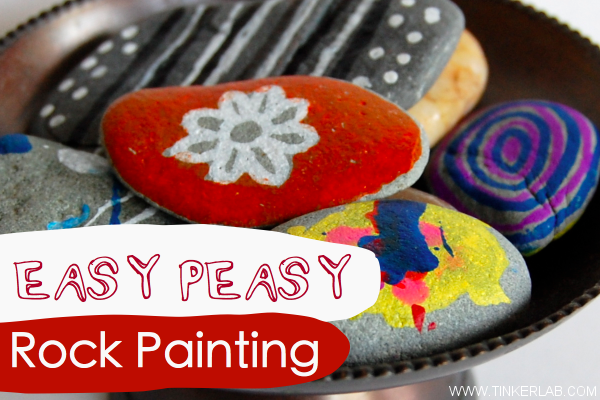 Jen at Paint Cut Paste shows you how to make thumbprint rock magnets. Tweet Tweet. This is one of my first posts: Rolling Rock Painting. It’s like rolling ball painting, but a little bit more unpredictable. 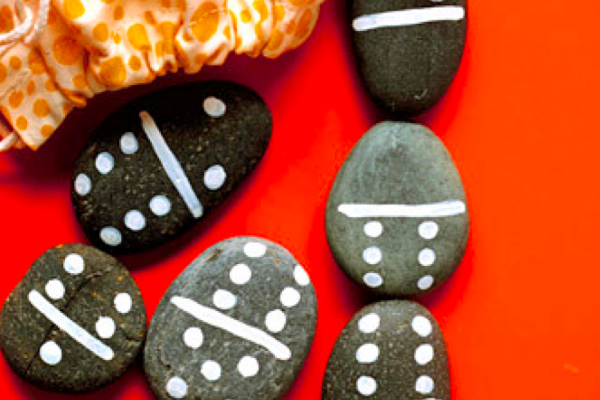 I love homemade games, and this rock domino set from Martha Stewart would make me so happy. 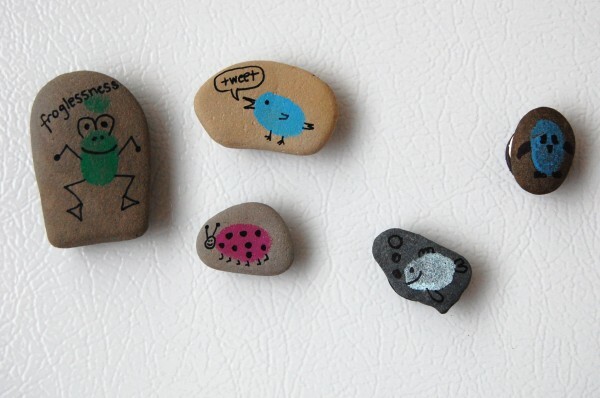 Have you or your kids painted rocks? 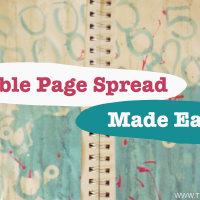 If you’re a blogger, feel free to share a link in your comment. 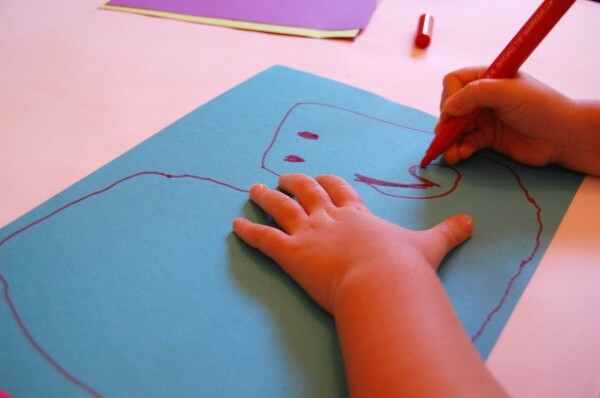 Do your kids like to draw? 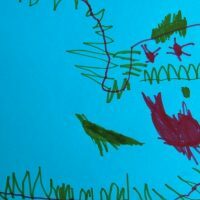 Do you ever play drawing games? 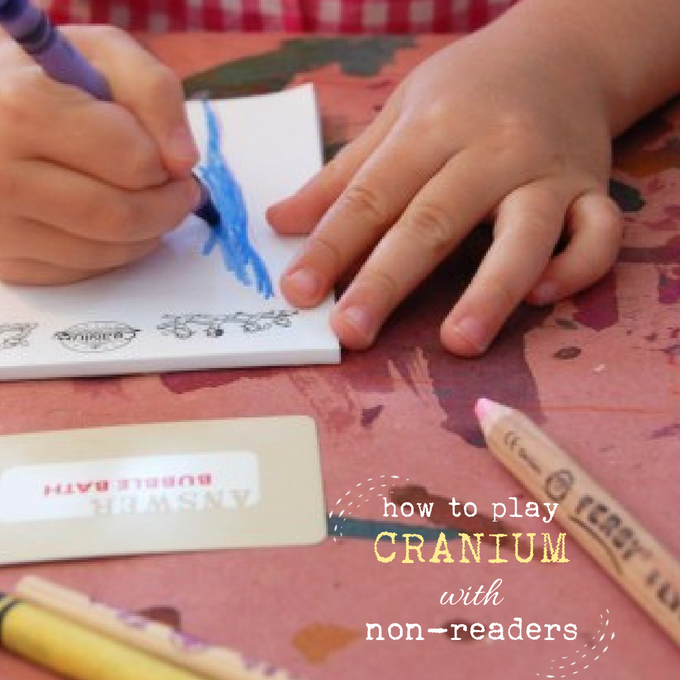 If you’re looking for a fun drawing board game to play with non-readers, I’ll walk you through how we did this with Cranium. The other day my kids and I were cleaning out the garage. Well, really it was me while they loitered, moved things around, and made a lot of noise. 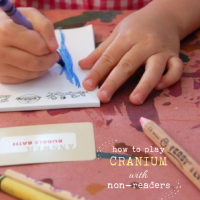 My 3-year old found an old, but never-before-opened game of a Cranium . She adores opening new packages and ran into the house for a pair of scissors. Once the box was open and she was done exploring its contents, she asked if we could play. I love how open-minded and full of enthusiasm children can be. If you look at the packaging I think it recommends this game for age 18 and older, so it wasn’t exactly age-appropriate, but we played a version that she enjoyed and I think it could work in some capacity for kids of all ages. I searched through the deck of cards for something that she had some chance of drawing (and understanding). Which meant “no” on Devil’s Food Cake, Card Shark, and Wicked Witch of the East, and “yes” on Mermaids, Bubble Bath, and Potty (short for Potty Training). I pulled out a card and read it to her while she looked on (and maybe picked up on how letters form words). 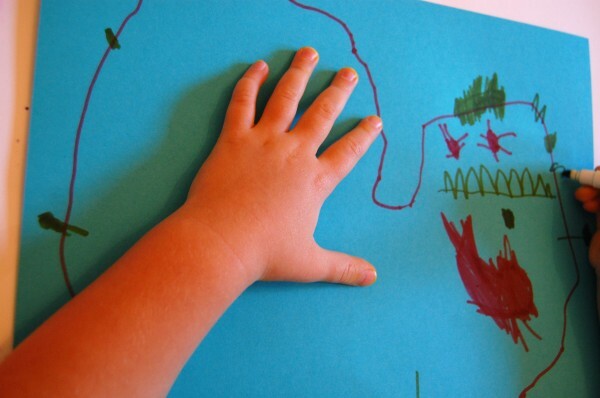 Then she drew it to the best of her ability. Then I drew one (a potty) while she guessed what I was drawing. Despite years of drawing classes, my drawing barely looked like a potty and it took her forever to make a correct guess. I think it helped her to see me struggle, showing that we can’t always create the things that our brains envision. At least I hope that’s what happened. Again, I was so curious to see how she would tackle this challenge. 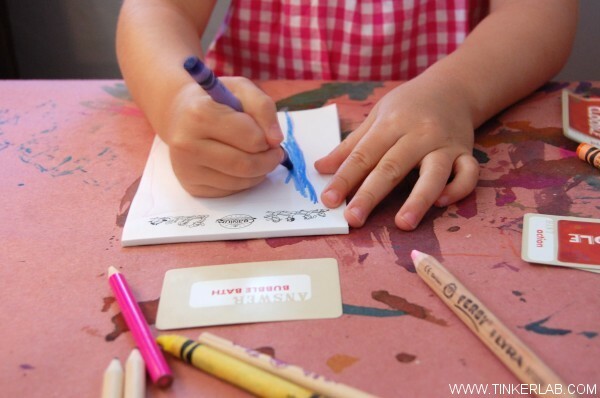 She chose a blue crayon…. Drew some water along the left side of the paper and bubbles on the right side. Ah, a bubble bath! We played a total of about 5 drawings before she was done. 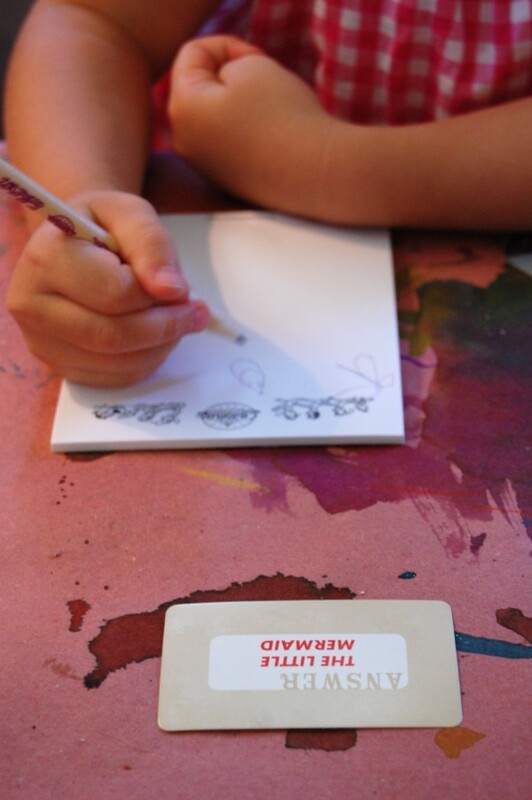 If I were to do this again, I’d make my own cards with words of things that are in her drawing vocabulary: flowers, people, rockets, and rainbows. And I’d include a few things just outside of her drawing ability: house, bike, tree, bunny. But venus flytraps and Hawaiian shirts may have to wait another 15 years. 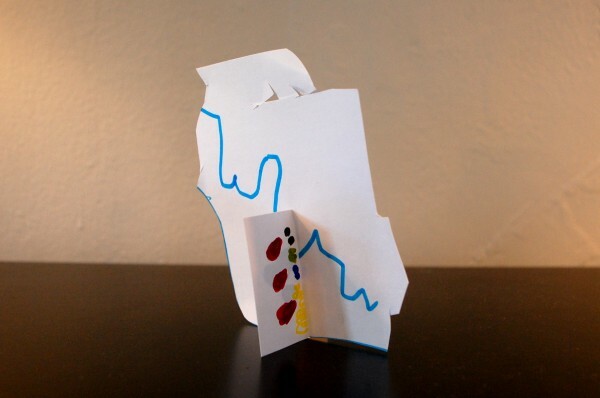 Art Dice: A fun tool for creating randomly-created art. 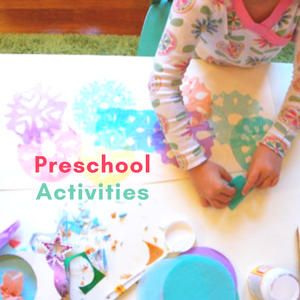 Also good for teaching shapes, colors, lines, etc. 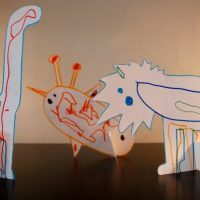 Organic Shape Monsters: You just need some string, a drawing tool, and a big imagination. 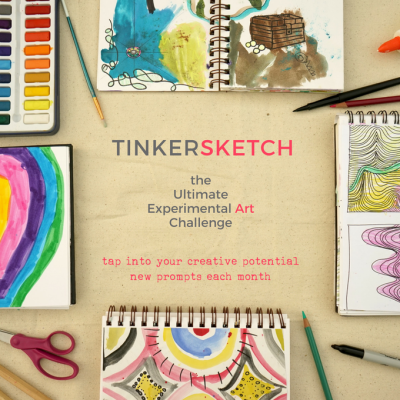 Do you have a favorite drawing game or post about a drawing game? I love collaborating with my three-year old, so I was thrilled when she came up with this idea for me to draw animal shapes for her to color in. We don’t have coloring books in our house (aside from a mandala coloring book suggested by Jen at Paint Cut Paste), so maybe this fed some deep seated need to color in the lines? When I drew the outline of the first animal I wasn’t sure where this was going, but N started coloring away with a clear vision in mind. She’s a true director, putting me to work on the the details while she masterminded the big picture. 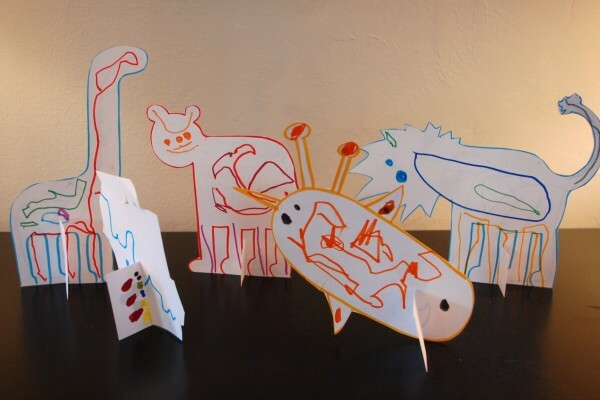 When she came up with an idea to make the animals stand up, we cut them out, cut small slits in the bottom of the animals and a matching slit in the opposing “stand,” and we suddenly had the makings of a zoo! After working on the bee, N worked on which way she wanted it to stand. And she even made her own animal shape. I tried to pin her down (in the most open-ended way possible) on a name or type of animal, but she kept me guessing. I think it was just a shape, but you never know! 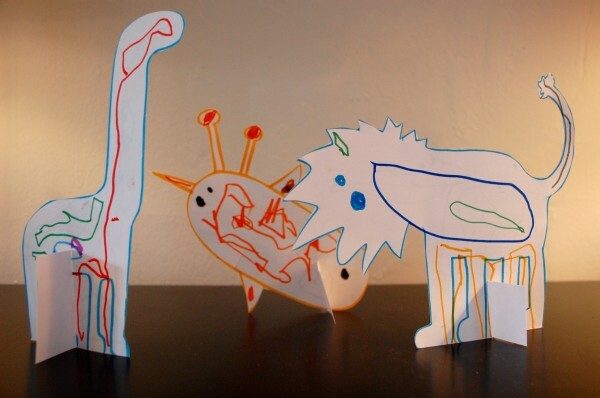 She colored both sides of the animals, making them truly three-dimensional. 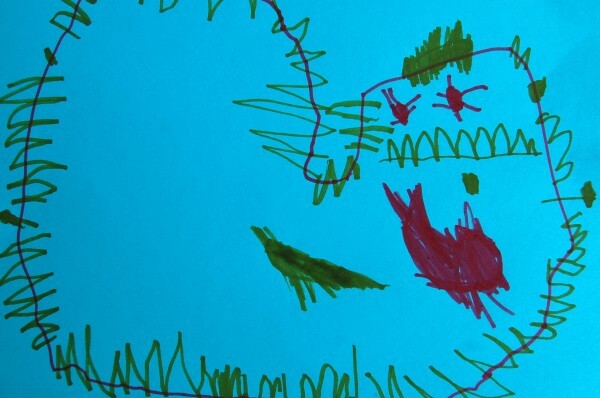 She’s just started to draw with representational marks, and I love seeing how faces and other recognizable objects emerge through these marks. 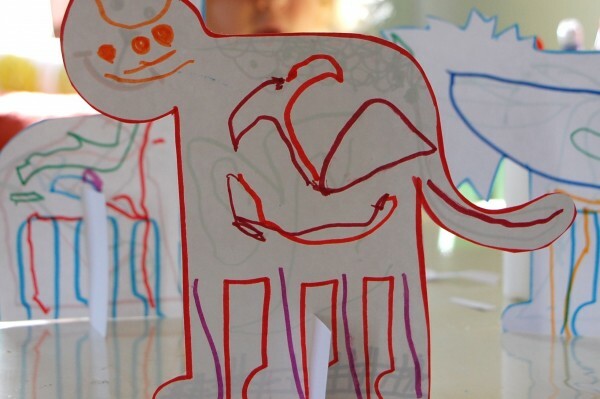 Would you make a pop-up zoo? After making these I thought some of you might like to have some animal templates to print out. If you do, let me know and I’ll make a PDF set that you can download.